Tomorrow night I’ll be heading to Brooklyn for my first NYC show in some time! 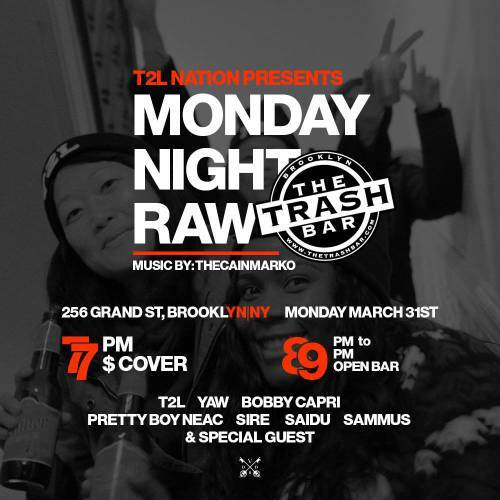 If you’re free come through to Trash Bar [256 Grand Street] where I’ll be spitting some raps at T2L’s Monday Night Raw with other dope artists like Saidu, Sire, and of course T2L themselves! Doors open at 7pm and the damage is 7 (open bar from 8-9). RSVP on Facebook so I know I’ll see you there!